Preheat oven to 350 degrees F. Line a large baking sheet with parchment paper or a silpat non-stick mat. With an electric mixer, in a large mixing bowl, cream the butter and sugars until combined. The mixture will look grainy. Add in egg, vanilla extract and mix until well combined. Next, add in flour, instant pudding mix, baking soda and salt. Mix until just combined on low speed. Cookie dough will start to form. Be careful not to over mix. 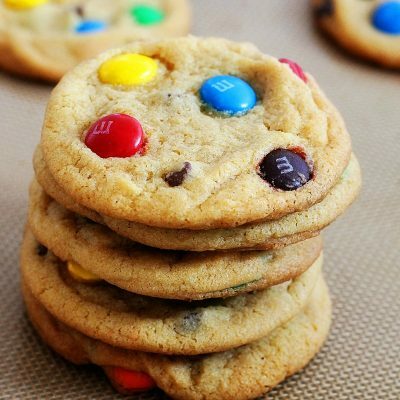 Add in the mini chips and M&M’s and stir in with a wooden spoon until they have been incorporated in the dough. Use a mini ice-cream scoop and scoop cookie dough balls. (Scooping this way will make your life so much easier!) Place dough scoops on baking sheet, 1 – 1 ½ inch apart. Press additional M&Ms on top and slightly press down with your hand. Bake for 10-12 minutes or until a light golden brown. Let the cookies cool on a cooling rack for about 10 minutes and then enjoy!